Natural Knits!, a photo by MadeleineS on Flickr. Back in February we met the organisers of the Midlothian Science Festival at a networking event. They were looking for some science and knitting input for their programme so we stuck our hands up and said “pick me please!” – and they did! The festival takes place in October in the towns and villages of Midlothian. Roslin village is one of them. 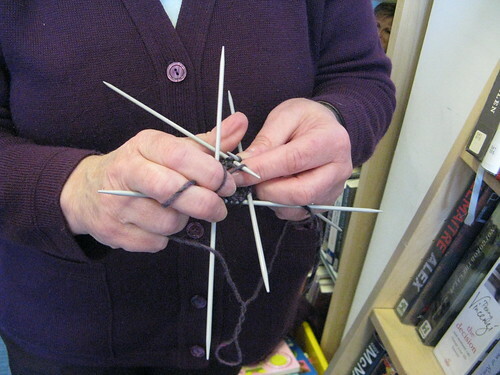 They have an active knitting group called Knit, Knot and Sew who exhibit in the local library from time to time. The idea was for them to try out some of our patterns over the summer and then come to a public workshop during the festival. Roslin Library hosted the workshop on 12 October and very friendly hosts they were too. 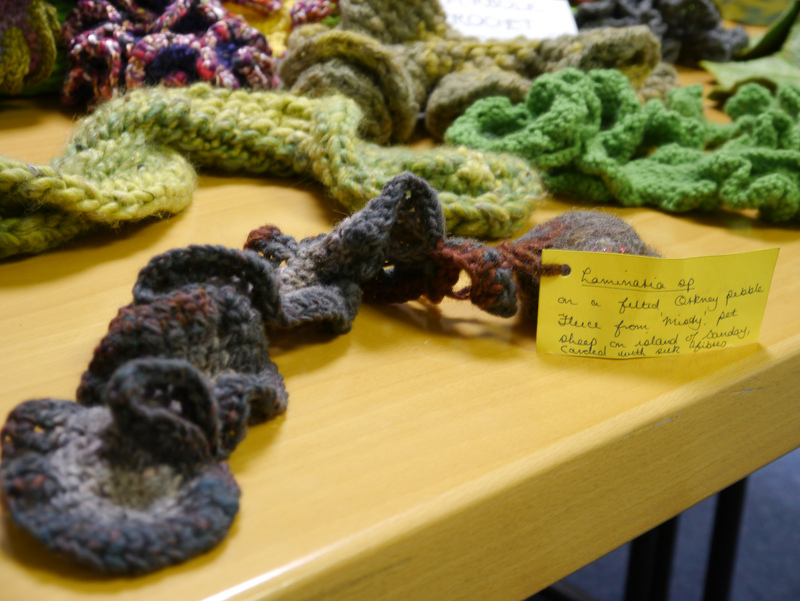 The Knit, Knot and Sew group had dropped off a lovely basket of hyperbolic knitting chanterelles and some came along to try out the binary bonsai pattern on the day. Once the trees started to take shape there was a lot of enthusiasm for making more as presents for friends and family. 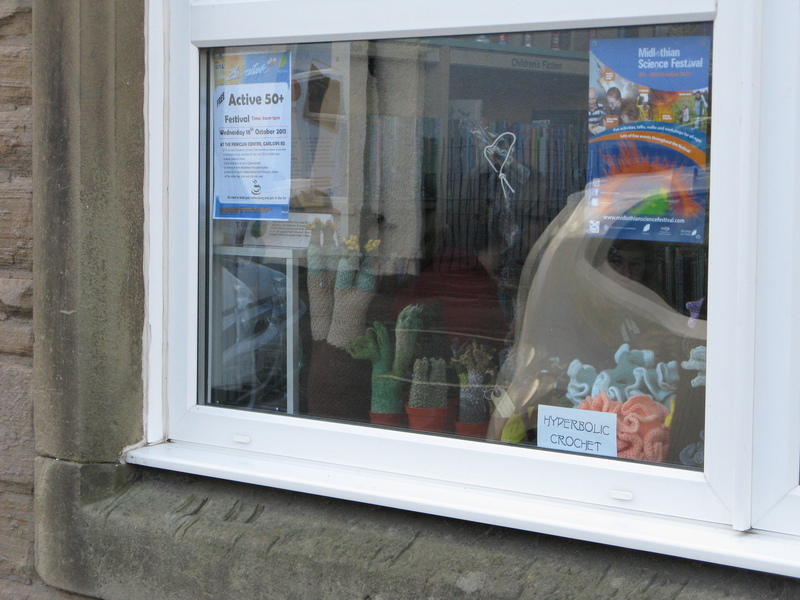 We left a little display of trees and fungus, pattern leaflets and yarn with the library for the rest of the festival and to inspire the local knitters. I’m really looking forward to collecting the results. 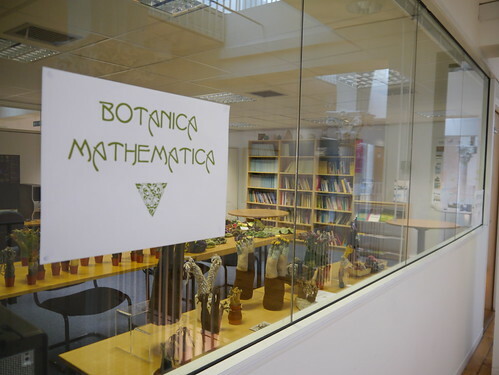 Botanica Mathematica at ICMS, a photo by MadeleineS on Flickr. Doors Open Days is a project that encourages buildings not normally open to welcome the public in for a nosey around. The focus is architecture but most have some more exhibits and activities. 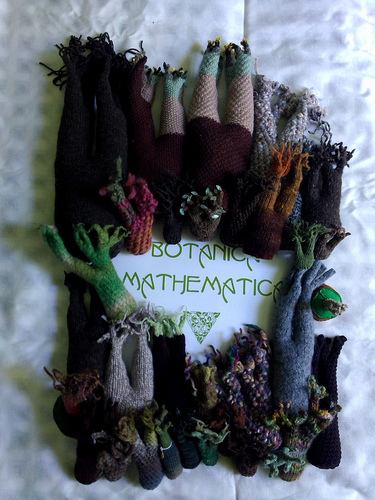 On 28 September my Day Job at the International Centre for Mathematical Sciences involved taking part, so they asked me to bring along Botanica Mathematica. We set up the entire collection in the glass walled room that houses the library. Around 200 people came along and from the way I was croaking by 4pm, it felt like I spoke to most of them! I know i didn’t because I lurked in corners to take photos. One of the 200 visitors was a schoolteacher I met in Orkney. She’d taken a few of the kits I had there to try and get some of her pupils interested and dropped in with the results. Out of her bag came lots of lovely hyperbolic crochet algae and flowers. 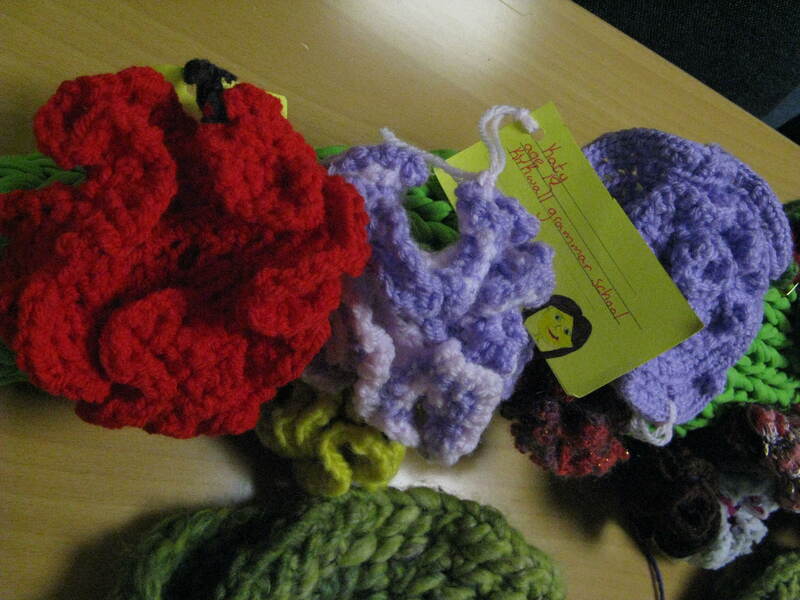 A special thanks go to Katy from Kirkwall Grammar School who I understand learned to crochet in order to take part with her red and lilac flowers! The algae included a lovely specimen of Laminaria sp. complete with holdfast attached to a felted pebble covered in fleece from a local pet lamb. It really makes the project feel worthwhile when I see how people can take the ideas we’ve set out and make them their own. I hope we get some equally good feedback from the people who visitied ICMS on Doors Open Day.